When I became a mom, I expected many challenges: sleepless nights, learning how to discipline, the transition from working full time to staying home. But there was one challenge I didn’t expect: loneliness. I often felt guilty because I had everything I wanted: healthy kids, a happy marriage, and a great church family. In fact, I was never alone! But I had never felt so lonely. What is wrong with me? I used to ask myself this repeatedly and then feel ashamed. I know I’m not the only mom of little kids with this issue. For many of our waking hours we are isolated and stressed out by unceasing demands on our limited strength and energy. The story in the Bible goes that humans were relational from the very beginning. God himself is relational and created us so that we would be in relationship with him. So it only makes sense that when we are isolated, we feel this sense of longing that can only be filled with another person. To be honest, I have an amazing, supportive husband and we have a great relationship. I know that this isn’t the case for everyone. But even then I can attest that he doesn’t meet all of my needs for connection. Perhaps that is just a result of the fall…we are flawed, and therefore our marriage relationship will be flawed. I also know that I have a need for connection with other women. They “get me” in support me in ways my husband can’t (and doesn’t particularly want to!). We know we need relationship. God knows we need relationship. That’s why it hurts so much when we don’t have the relationships we want, be it a healthy marriage, a BFF, or even a child during a struggle with infertility. So the next time you ask yourself, “What’s wrong with me?” when you’re feeling empty, remember that you have valid and complex relational needs. God made you that way! 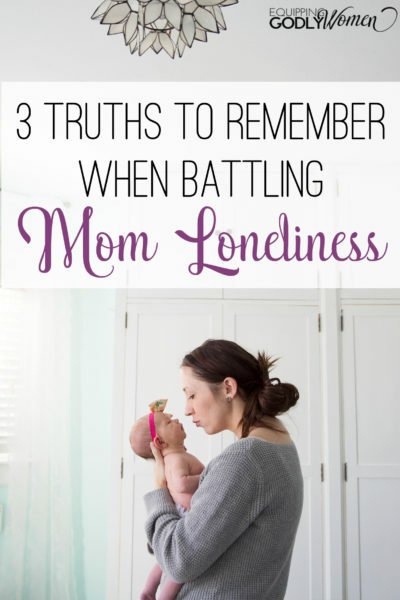 When you’re battling loneliness as a mom or in any stage of life, you can feel guilty for your feelings, especially when things are going well otherwise. I would beat myself up for not being more grateful for this otherwise amazing life I had. It took me a long time to come to grips to the fact that, while I should still “choose joy” when possible, there is nothing wrong with feelings of sadness or grief. Jesus himself said, “Blessed are those who mourn, for they will be comforted” (Matthew 5:4). In my times of loneliness, I was forced to mourn what I was missing. I did a cross-country move when I was pregnant with my second child, and I deeply missed my old friends (and still do). Since that move I’ve had two more friends move away from me, which has spurred more mourning. I get jealous of my friends and acquaintances that have been in the same location together since their college days and are raising their kids together. I’ll never know what that’s like. If I hadn’t mourned those losses and simply glossed over the pain, I would never have been able to give my full heart to my newer friendships—which I still desperately need. My lonely times have strengthened my faith unlike any other experience. When the Bible acknowledges in Genesis that it is “not good” to be alone, in my experience, I’ve found that being “alone” actually draws me nearer to God. When I was grieving the loss of my old friendships—and even still now when I have lonely days when I’m losing my mind at home with the kids—I’ve had nowhere to go but to my knees in ugly pray-crying. I hate those moments, I really do. But I also know God has used them to refine me and draw me into his own loving arms. Recently I’ve discovered that so much of the Bible is about people who suffer a period of loneliness, suffering and grief. For starters: Moses, Hannah, Job, David, Elijah, Jeremiah, Paul and yes even (especially!) Jesus himself. But we know in hindsight that God used those periods to refine them, strengthen their faith and ultimately draw them closer to him. Just as he has done with us. While I still don’t like it, loneliness doesn’t wreck me anymore because I see the big picture. What’s more, I know that through the Holy Spirit, Jesus is with me always (Matthew 28:20). Is there something you’re struggling with right now? If so, I just want to encourage you that no matter what it is you’re dealing with, Jesus is still there for you and he still has a plan for your life. I’d also like to invite you to check out a new video series on Trusting God’s Plan. It’s free to join in and oh so encouraging. You can find more information and sign up here. I really hope you’ll join us! What about you: do you battle with loneliness? What could you change about your perspective that would help you embrace this period in your life?